Some people will do anything to beat the summer heat. Anyone who lives somewhere it gets very hot, like I do, understands how frustrating it can be to be stuck somewhere without air conditioning. This DIY airconditioner was built by a clever Flickr user who found himself stuck in apartment with no air conditioning. He made the DIY air conditioner with products that can be easily found around the home or in your local hardware store. A regular table fan was used as the base of the project as well as fish tank pumps, flexible plastic tubing and copper tubing. 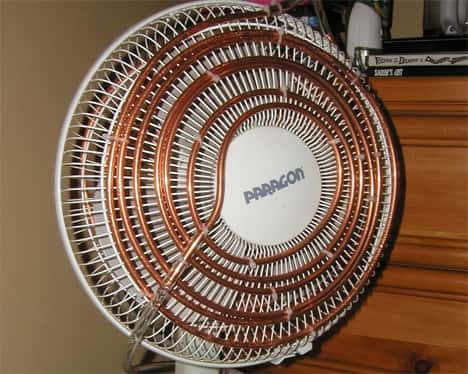 As you can see in the photographs, the copper tubing has been formed into spiral shapes around the front and the back of the fan. The fish tank pumps pump water through the coils so that when the fan operates cold air is blown into the room. 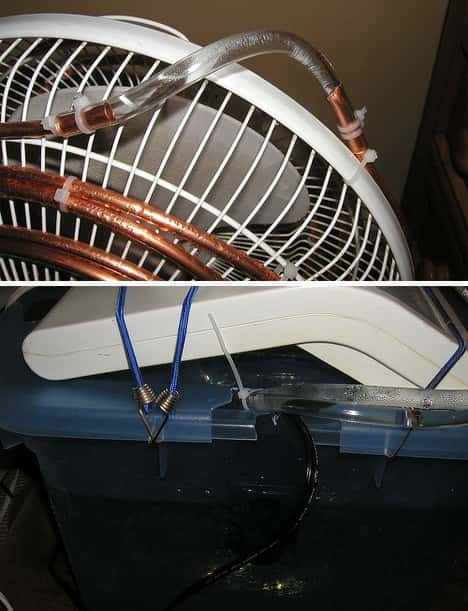 The plastic tubing has been used to connect the copper tubing to the reservoir so that the fan can rotate in it's usual fashion. People sure do create some interesting stuff in the name of neccesity, better than being miserable in the heat that's for sure!